Mike passes his free time reading, learning about history, and hanging out with his family. With all the exciting recent discoveries in planetary science, and the fact that his three kids share his interest in science, Mike has been dedicating relatively little time to matters outside of science for the past few years. As a planetary scientist, Mike studies the atmospheres and evolution of planets, including how they are born, how they change over time, and how they die. His work has examined Earth and nearby planets like Venus and Mars, but also distant planets outside our solar system called exoplanets. From the age of 6, Mike knew he wanted to study planets, but he didn’t know you could get a job doing this. He grew up in a small farming community in Western Kentucky far away from any city. When Mike went outside at night, he could see thousands of stars. Mike was a curious kid and to help answer some of his questions, his dad got him a small telescope and some books on space. The first object Mike saw through the lense of his telescope was the bright yellow of Saturn surrounded by its rings. He was fascinated. Neither of Mike’s parents graduated high school, and he didn’t know anyone who went to college, so Mike didn’t know how he could pursue his interest in planets outside of a hobby. Mike’s high school guidance counselor had recommended he buy his uncle’s farm to raise cows and chickens, but after speaking with people at the local college, he decided to attend. It was there Mike learned that he could be paid to do astronomy. The NASA New Horizons mission to Pluto was fraught with challenges. The team spent a lot of time getting the mission approved by NASA, securing funding, launching, and then having the craft get to Pluto. Mike had invested 20 years of his life into this project, and there were so many ways that things could have gone terribly wrong. There were times when it looked like the mission wasn’t going to happen because NASA cancelled the program and didn’t have funds to build the spacecraft. During these times, Mike was tempted to leave science altogether because jobs were scarce and it was a struggle to get funding for space missions. Mike’s interest in the science and support from his colleagues carried him through when he wanted to give up. Shortly after starting his faculty position, Mike was working with students and collaborators on a project looking for life on Mars. They were interested in whether you could transplant Earth bacteria to Mars and whether it would survive. The team discovered that a type of bacteria called methanogens could live off of the gases in the Martian atmosphere, and they produced methane as a byproduct. These findings were compiled in a short paper describing how these bacteria may live under the surface of Mars and how much methane you may find in the atmosphere if they were there. A few years later, methane was detected in the atmosphere of Mars in amounts very similar to what they had predicted. This was a thrilling discovery in terms of the degree of accuracy of their predictions and the possibility of discovering signs of life on another planet. The source of the methane is still unconfirmed and is the subject of ongoing research. From his small telescope of early childhood, Mike graduated to larger and more sophisticated instruments over the years. At CalTech, he was able to use the Mount Palomar telescope which was the largest in the world at the time. However, in his later years at CalTech, Mike had a fantastic opportunity to use the infrared telescope at the Mauna Kea Observatories to measure heat radiation from Pluto. The telescope is located at the highest point on the Big Island of Hawai’i at about 13,800 feet in altitude. Mike had a phenomenal experience spending several nights there stargazing outside and using the telescope. During the New Horizons Mission flyby of Pluto, the team worked incredibly hard. Mike was in the lab from 6am until about 2am every day with his colleagues for about 50 days, and everyone was exhausted. There was a deluge of new and exciting discoveries related to their observations of Pluto. With nearly 200 press teams on site at Mission Operations attempting to keep up with the findings, there was a steady stream of press interviews. This was both thrilling and incredibly taxing. At the end, they had a press conference at NASA headquarters, and Mike was one of five individuals selected to summarize all of the major discoveries of the encounter. This was a huge event that was broadcast live from NASA TV with millions of people watching. By the time it was ready to start, the team was so tired that they were struggling to just stay awake. Mike succeeded in maintaining consciousness and indulged in a well-deserved 14 hours of sleep afterwards. If you believe in something and you think it is worthwhile, don’t give up. Keep working towards it. You never know where you’re going to end up, but keep moving forward towards where you want to be. Also, the universe is unbelievably complex and amazing. We are now rapidly discovering things about our universe and our place in it, and you can be a part of these discoveries. Mike is a planetary scientist who specializes in the study of chemical and dynamical processes in planetary atmospheres. His work is primarily theoretical in nature, but he serves on several space mission science teams (UARS, MAS, Space Shuttle, New Horizons, AIM, ARES Mars Airplane, among others) in the role of science planning and in the interpretation of spacecraft observations. 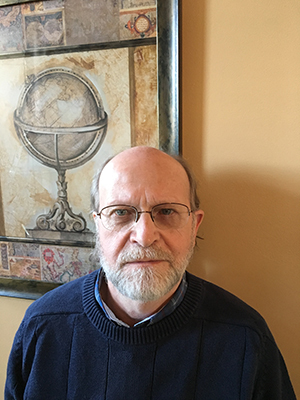 Mike’s planetary research has dealt with the structure and evolution of the atmospheres of Earth, Mars, Io, Titan, Triton, Uranus, Pluto and its moon Charon, and more recently on the characterization of atmospheres on extrasolar planets. He was a member of the Science Team of the New Horizons mission to Pluto/Charon and the Kuiper Belt. His work on Earth’s atmosphere has dealt with middle atmospheric ozone chemistry, the chemistry and dynamics of trace gases such as methane, water vapor, and carbon monoxide, heterogeneous chemistry on meteor dust, the influence of solar variability on the state of the stratosphere and mesosphere, and polar mesospheric clouds and their connection to climate. He is a member of the science team of the AIM (Aeronomy of Ice in the Mesosphere) Small Explorer mission that was the first dedicated mission to study the role of these high altitude clouds as indicators of global climate change. Mike is also active in education and outreach activities, having given over 1000 public talks on science and technology. In addition, he serves as advisor for education and research to the commercial space industry and has served on numerous NASA panels and research groups as well.